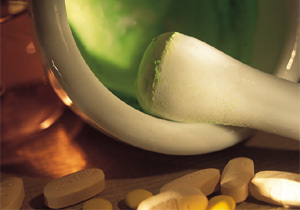 The classification of antineoplastic herbal medicines here is based on their effects as categorized by the traditional theories, it is necessary to relate here why, according to the principle of traditional Chinese medicine (TCM) that herbal medicines with various pharmacologic effects can act as an antineoplastic agent. Generally speaking, the herbal medicines with heat and toxin clearing action are prescribed for illness displaying heat-toxin syndrome. Some of the patients suffering from neoplasm manifest as suffering from heat-syndrome, such as fever, thirst, deep-colored urine, red tongue, rapid pulse, etc. At the same time, signs of heat-toxin retention are shown, for example, necrosis and secretion of stinking tumor mass; foul dirty vaginal discarge in cervical carcinoma cases; purulent and bloody stool in colonic carcinoma cases; hematemesis, epistaxis and subcutaneous hemorrhage in leukemia cases; jaundice, hematemesis and hemafecia in hepatic carcinoma cases; and so on. The herbal medicines in this category are effective for relieving the heat-toxin syndrome hich appears in the patients suffering from neoplasm. The herbal medicines with blood-regulating action serve to activate blood circulation and eliminate blood-stasis, or to stop bleeding. In some of the patients suffering from neoplasm, there may be a palpable mass with localized pain and accompanied by a diminshed complexion, a dull tongue with petechiae or ecchymoses, and an engorged sublingual vein. These signify a blood-stasis syndrome. The herbal medicines with blood-circulation activating and blood-stasis eliminating action can remove the blood stagnation so as to dissipate the tumor and to relieve pain. Furthermore, hemorrhage may also be seen in the neoplastic cases, which is caused by blood-heat, blood-stasis, or blood extravasation due to heat. For these cases, the herbal medicines with hemostatic effect not only serve as a symptomatic treatment but also as a causative treatment for cooling the blood, purging fire and eliminating blood-stasis. The herbal medicines with phlegm-removing action serve to eliminate the secreation of resporatory tract and the phlegm elsewhere. As the term phlegm in TCM is rather broad, the manifestation of phlegm-syndrome varies with different locations in which the phlegm accumulates. When it is accumulated in the lung, the case may mainfest as dyspneic cough with expectoration (e.g. lung cancer); in the stomach, as nausea, vomiting and epigastric fullness (e.g. gastric cancer); in the meridians and subcutaneous tissues, as scrofula and subcutaneous nodules (e.g. cervical lymphoma, cervical metastatic cancer, mammary carcinoma, etc. ); in the brain, as dizziness or disturbance of consciousness (e.g. brain tumor). Hence, the herbal medicines of this kind may serve to relieve the phlegm-syndrome occurring in the neoplastic cases. The herbal medicines with diuretic and dampness-eliminating action are applied to cases with retention of fluid and dampness. Some of the patients suffering from neoplasm show a fluid-retention or dampness-accumulation syndrome, manifesting as edema, ascites, leucorrhagia, diarrhea, or dysuria and associated with a corpulent tongue covered by thick turbid and smooth fur. The herbal medicines in this category can relievesuch disorders occurring in the patients. The herbal medicines with tonic effects are used to treat asthenia-syndrome cases with manifest as insufficiency of vital energy, blood, yin or yang. Because debility and deficiency of healthy energy is one of the important causes responsible for tumorigenesis, and a neoplasm already developed may further impair the healthy energy, so the patients suffering from neoplasm usually display an asthenia-syndrome. The application of tonics may enhance the body resistance and is certainly beneficial to the antineoplastic therapy. In fact, it has been found that many herbal medicines with tonic effects can promote the immunologic, hemopoietic as well as digestive functions of the body, and some of them even serve as an inhibitor or killer of the tumor cells. When applying this kind of herbal medicines, the principle of trestment in line with syndrome differentiation should be followed, and the medicines selected for use should match with the attribution of asthenia-syndrome (i.e., whether it is asthenia of vital energy, blood, yin-yang, or one of the viscera). The herbal medicines for external application are generally erosive and poisonous, and their dosages should be strictly handled. They are applied on the surface of tumor, or as an infiltrate into the mass or around its base, to induce necrosis and exfoliation of the tumor.